With more than $800m so far invested in bitcoin and blockchain technology startups since 2012, it's safe to say that venture capitalists are certain captivated. Investments in the industry have already exceeded the cumulative total for 2014, with more than $380m pledged to startups in publicly announced funding rounds this year. While an impressive figure on its own, what that number doesn't successfully convey is how many seed to late-stage firms are making bets on the new wave of innovators aiming to take bitcoin and blockchain technology forward. CoinDesk's Bitcoin Venture Capital data indicates nearly 200 VC firms have invested in bitcoin companies, a total that excludes the many individual and angel investors that have participated in public funding rounds as well as the various private deals kept out of the public eye for as-yet-unannounced stealth projects. Out of these many investment firms, however, clear leaders have emerged whose investment deals and ideals have influenced the wider ecosystem. With this in mind, we've compiled a list of 10 of the most influential and visible investment firms in the industry. I am quite surprised that amount of capital invested in bitcoin is that big already. With that support I wonder why bitcoin is not huge but still marginal technology and payment method. I don't know if any of the presented initiatives will be successful enough to break that ice fast. At the current rate bitcoin is progressing, it's quite baffling that despite all the hype and potential surrounding the technology, it is still moving at a much slower rate than expected. We have been harping on the issue of mainstream adoption and then we also have the promise of huge investment by the wall street guys but what we have seen thus far, admittedly are far less than convincing. We know it's possible for exchanges to play around with the price: there's some fractional reserve going on in here. But this can't last too long. I guess for the day traders it is more profitable to stay in the lower digits (thus manipulating price), as making x % gains is easier at 100 than at 1000 worth. Would be interesting when there are better exchanges around and actual rules against price manipulation what would happen. Wouldn't that 'price anti-manipulation' rule be in opposition to basic bitcoin principle - freedom? What you ask is regulation so severe that it would shake bitcoin fillars. And bitcoin would be no different that FIATs which are manipulated by governments and financial agencies. anyway, we're in the hands of some miners' groups and some exchanges at the moment. According to a graphic from statista, Bitcoin has almost reached the payment volume of Paypal. 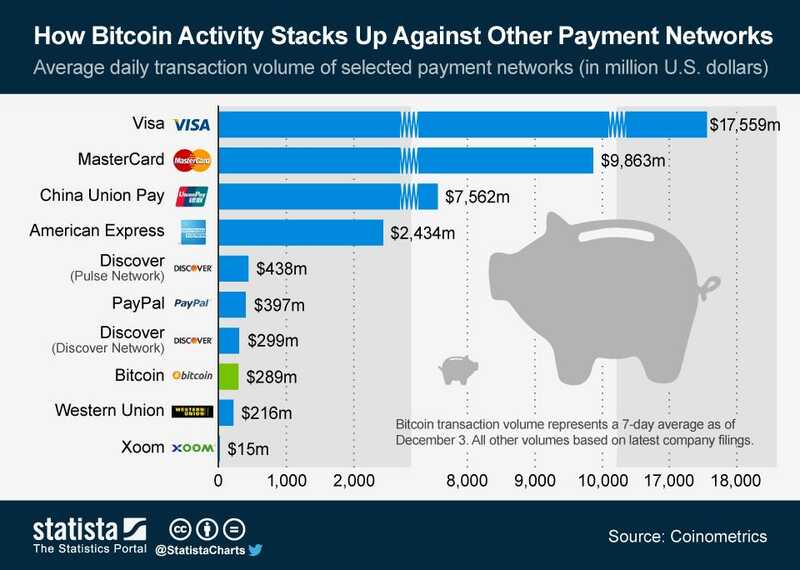 According a graphic from statista, Bitcoin has almost reached the payment volume of Paypal. No idea, where they get their statistics from. the daily transaction value in dollar hovers around 60 million US$ per day. So bitcoin is still small compared to Paypal. These are really great news. News and numbers like this can't make you but feel good about this beautiful technology. Investors are not dumb and they would not get involved if they don't see a big potential. Now if there is a price manipulation, and it might as well be one, it won't last forever. Bitcoin is still small and easily manipulated. As we grow, this will change as well. I think day traders aren't whales most of the time, they can't manipulate prices. They are know as sharks and simply ride the waves created by the actual whales. Whales don't profit from the risk of day trades, they make long-term stacking, make a good pump and then dump. If the bullish signal is real, the asset will survive and even keep growing after whales dump because of legit buy pressure being bigger than the dump. The chart says Bitcoin volume represents a 7-day volume as of Dec-3. So most probably, this was when the price of Bitcoin was much higher. You could be seeing lower volumes (in terms of USD) now. Yes, as time goes by, most of the startups, who raised a lot of fund, will yield results and launch their killer bitcoin applications to users. They will suppport bitcoin's price. As bitcoin adoption rate increases, there is more demand to bitcoin over supply. this is what most of us hope, but in reality high funding capital does not mean high quality apps. so there is still much uncertainty.